For two weeks in April, I ate and drank like a Manhattan investment banker before the economy collapsed. My series of decadent weeknight fetes began with the blowout blogger dinner at STK courtesy of The One Group, which was then followed by the ten-course affair at One Sunset a few evenings later. In between STK and One Sunset, Tony C. coordinated epic feasts at Jitlada and Aladin Sweets and Market. Last, but far from least, Fooddigger orchestrated an elaborate dinner at three-star downtown destination Church & State. 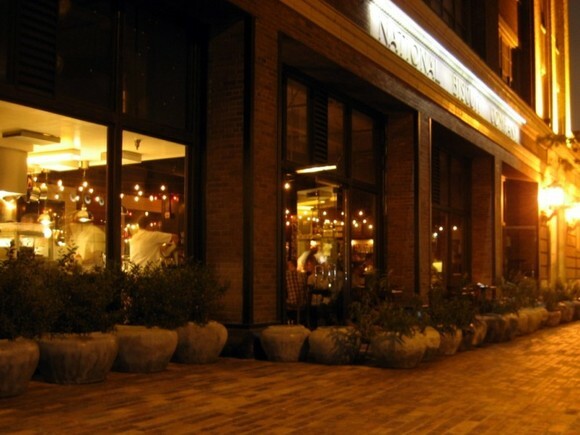 Housed in the former loading dock of the 1925 National Biscuit Co. building, Church & State specializes in French bistro fare. Walter Manzke, renowned for his stellar French-California cuisine at Bastide, Patina, and L’Auberge Carmel, heads Church & State’s kitchen with gusto. Fooddigger‘s founders, Will, Walter, and Eddie, gave Chef Manzke and sommelier Josh Goldman carte blanche over the menu this evening. 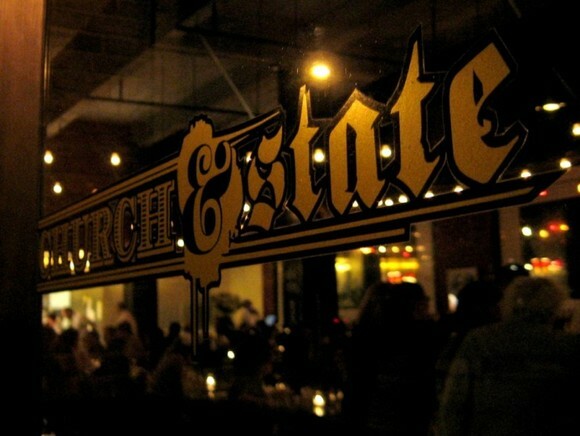 The result was a spectacular tasting of Church & State’s greatest hits, along with a few thoughtful innovations. Our meal was fit for kings, and I was impressed from start to finish. Our first bite of the evening were freshly baked gougères (left), which brought back fond memories of The French Laundry. Whereas Thomas Keller’s signature gougères were one-bite-wonders, these ones required at least three to polish off. The gougères’ larger size did not effect their characteristic lightness. After his untimely departure from Bastide, Chef Manzke contemplated his next move while staging at some of the world’s finest restaurants, including The French Laundry and El Bulli. The gougères are a nod to the time he spent in Yountville. 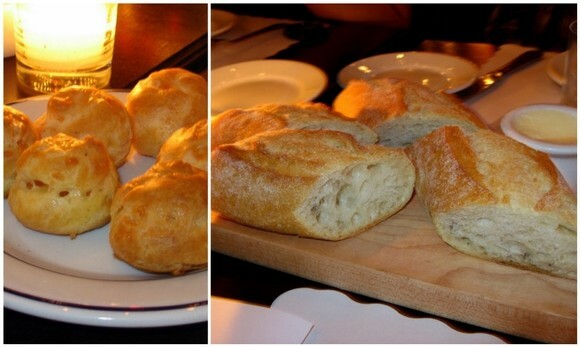 Accompanying the gougères were crusty baguettes with butter (right) presented on cutting boards. The next delights to arrive were the Beignets de Brandade de Morue (left)—bacaloa (dried salt cod) mixed with pureed potatoes and deep-fried until golden. This dish’s flavor was mellower than I expected, especially considering the ratio of bacaloa to potatoes. The beignets were accompanied by a subtle saffron aioli. 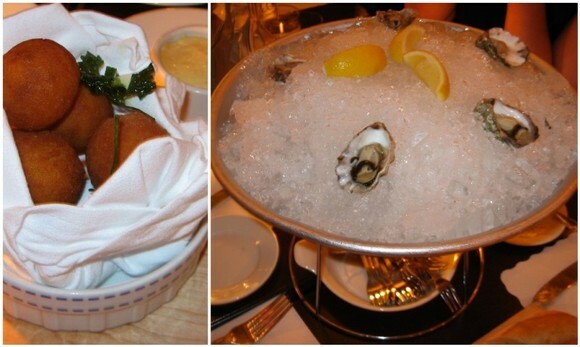 The Kumamoto oysters (right) that arrived next were presented on crushed ice with lemon wedges and a red wine mignonette. I ate mine straight up to fully take in the oyster’s briny goodness. The deliciousness of this course was in its quality and simplicity. 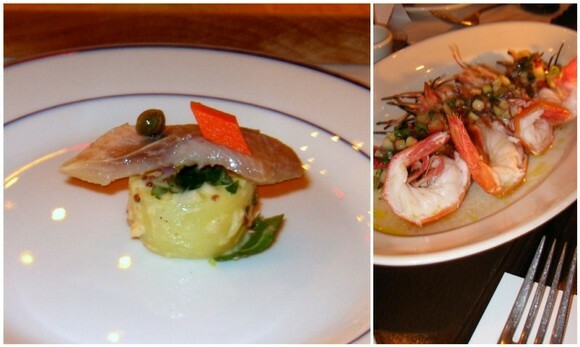 Chef Manzke created a special “Bistro Sushi” (left) for our group. Traditional sushi rice was replaced with a fingerling potato salad, which was topped with a slab of smoked herring, and a single caper and carrot dice. The smoked fish was the dominant flavor in this artful and well-seasoned dish. The Gambas à la Niçoise (right), Santa Barbara Spot prawns with lemon and olive oil, showcased California’s amazingly fresh seafood. The fresh-from-the-coast prawns needed very little adornment to shine. The charcuterie course filled my heart with joy. 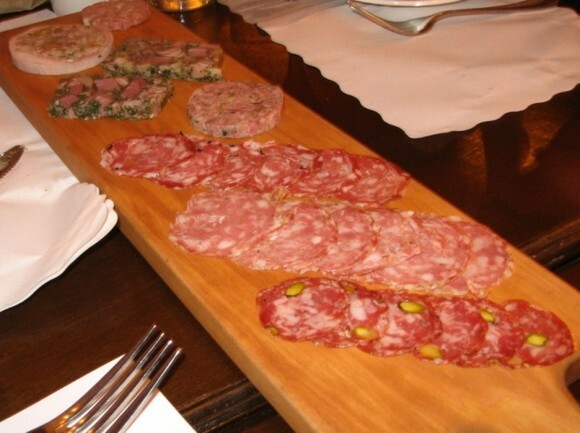 The selection of artisanal and house-made meats included saucisson sec (cured sausage), pâté, jambon persillé (pig’s feet and Kurobuta ham with parsley), lamb with espelette pepper, and rabbit galantine with pistachios. 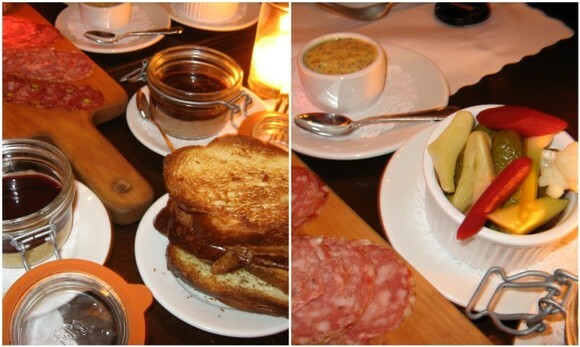 Jars of foie gras and pork rillettes (left) arrived alongside the charcuterie platter. The foie gras terrine, which was topped with a Port wine gelée, was smooth, creamy, and totally squeal-worthy—cold foie gras preparations are a favorite of mine. The rillettes de porc with prune confiture and Armagnac had a rustic texture and satisfying meatiness. Toasted brioche, pickled vegetables, and whole grain mustard (right) were on hand to balance the blunt decadence of this course. To counter the previous course’s richness, Chef Manzke sent out another special creation—Asperge à la Tashiro, named after Fooddigger‘s founder Marshall. 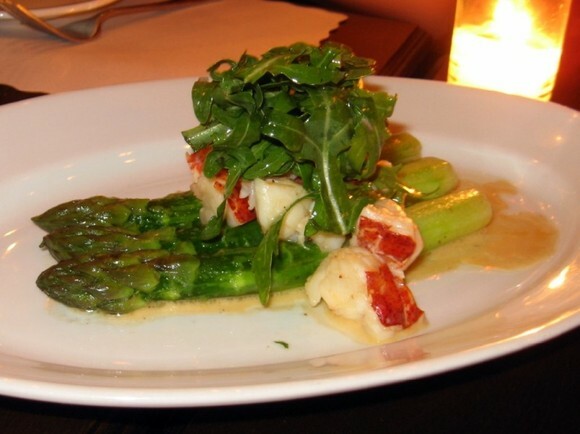 The thick and tender stalks of Hog Farm asparagus were paired with Maine lobster in a simple buttery sauce and topped with arugula. Alsatian-style tarts are another one of Church & State’s specialties. 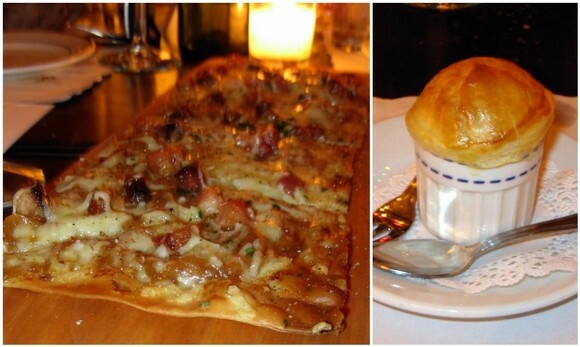 Chef Manzke sent out the flammenküche (left), a large rectangular tart topped with sweet caramelized onions, cubes of bacon, and Gruyère cheese. It was fan-bloody-tastic. The Escargots de Bourgogne (right) wowed us all. Each adorable porcelain vessel contained snails baked in garlic and parsley butter capped off with a piece of puff pastry. I was looking forward to tasting Church & State’s famed moelle de boeuf (roasted bone marrow) all evening. 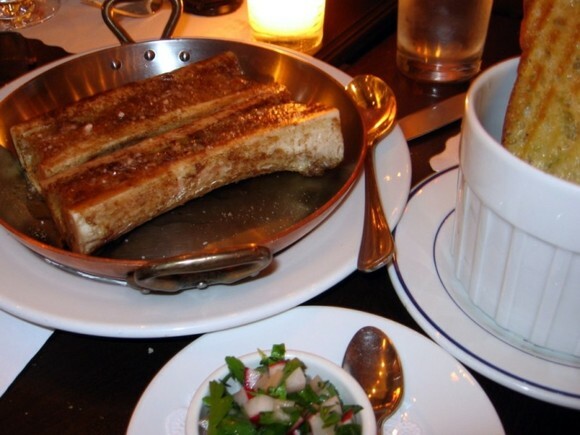 The huge bones were served with stacks of crouton bread and a salad of radish and parsley. As I slathered my bread with marrow, and sprinkled it with radish and parsley, Chef Manzke swung by my end of the table to talk. The Chef and I chatted a good long while about our travels in Asia and his stint in Spain, and before I knew it, one of the waiters had swooped in to clear my plate. Moelle de Boeuf—fail. 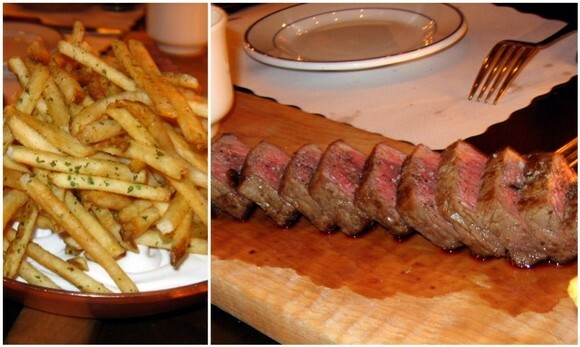 The final course of the evening was steak frites. Even though the steak was perfectly pink in the center, the tough texture required a bit of a chew. The accompanying frites au lard were very well prepared. 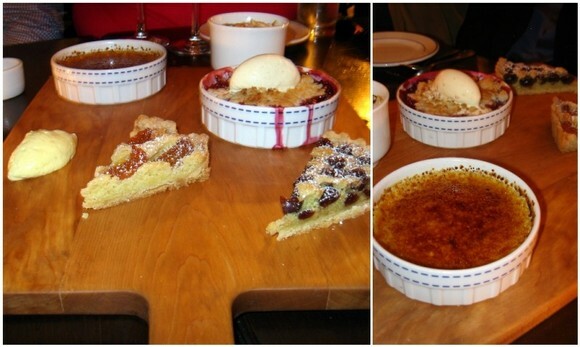 For dessert, we shared an assortment of seasonal sweets, including crème brûlée, cherry tart, apricot tart, berry cobbler, and a pot de crème au chocolat. The warm cobbler with vanilla ice cream was especially delightful. 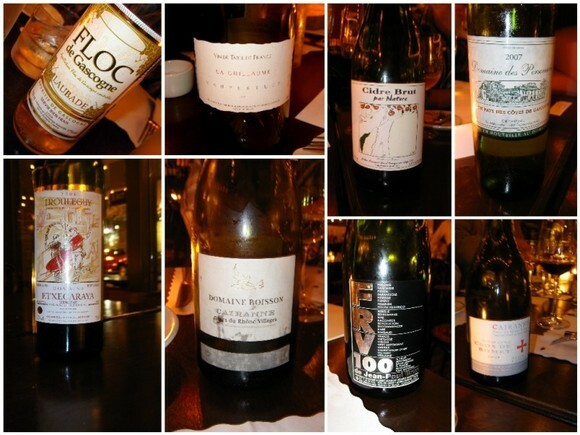 Church & State’s sommelier Josh Goldman paired the following wines with our luxurious supper. Lastly, a very special thank you to Fooddigger‘s Will, Marshall, and Eddie for inviting me to this ridiculously amazing dinner. This meal goes down as one of the greatest dining experiences I’ve had in Los Angeles since my arrival last October. the Escargots de Bourgogne are my favorite… I’m hungry! I am extremely jealous. Herring, foie gras, brandade, marrow — that’s my dream menu. Wait. You didn’t have the bone marrow at all?! I’m so glad you enjoyed the meal! I’ve been waiting forever for your post. I’ll make sure you get the marrow if we go again. Otherwise, be well and let me know if you’re in town. Everything looked amazing! I’m so jealous! Although, unlike you, I would not be running enough to burn all those calories!! The dinner sounded amazing. It was the next best thing to be able to experience it through the blog! That’s an incredible meal. So many things on the menu appeal to me. One of the problems with falling in love with France is that French food can be so elusive. I love, love, love charcuterie, but can’t easily eat it in restaurants here. Anyway – I think I have a new entry for my list of Things To Do In LA when next we visit. Quite the spectacular feast! Sounds like an unforgettable evening. What an incredible meal! I can’t believe all the food! And nothing chintzy and useless either. Lucky you! Good grief, you have been living the good life – it’s a good thing you’re a runner! Sounds like an amazing and decadent feast. C+S is a dream. If you haven’t gone already, what are you waiting for? In hindsight, TOTALLY worth it!! Pass the marrow, please. I didn’t get any the first time around. But I really shouldn’t be reading this … this amazing-sounding-and-looking meal that I had to miss *sob* *sob* Sorry to hear about your marrow-fail experience, but at least you got to chat lengthily with Manzke? I just finished my review, finally!